GROHE products have been created to last a lifetime, to be both easy to use and instinctive to operate and to make the use of pure water a pleasure. 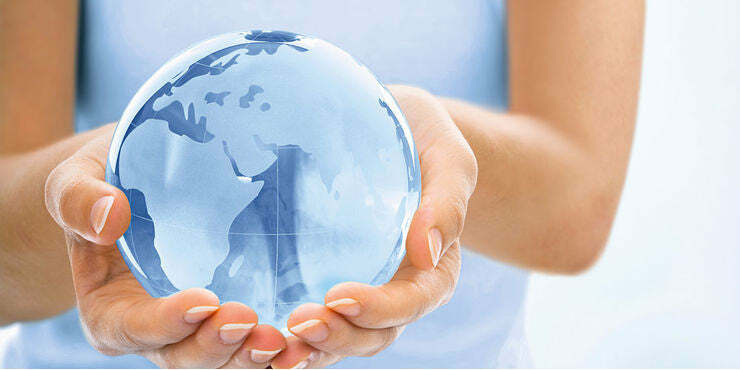 GROHE EcoJoy™ products are designed to save water and energy so that valuable resources are conserved. These products, with water saving technology, offer the best water experience without the need for compromise. Reducing the water and energy consumption goes hand in hand convenience and attractive design. Less water, Perfect Flow. This highly innovative technology reduces the water consumption by upto 50% without compremising on performance. GROHE is the only manufacturer that offers a full spectrum of water saving products for your shower, bath or sanitary installations. Only GROHE mixers offer the unique GROHE SilkMove® experience. The smooth handling of GROHE's single lever mixers perfectly expresses the quality and superiority of the brand. GROHE SilkMove® cartridges deliver gradual and precise control of the water flow and temperature. The SilkMove® cartridge is the centerpiece of every mixer and where the ceramic disks are located. They are made from a space proven ceramic alloy. The polished surface of the disks are the coated with a special lubricant with Teflon® technology for frictionfree performance The lever handle of the mixer is connected to the disks by a solid brass element for maximum durability and strength. GROHE is one of the worlds leading faucet manufacturers and one of a few worldwide that manufacture their own advanced cartridges. GROHE cartridges are designed to withstand years of use - for a lifetime of maintenance-free operation. GROHE SilkMove® ES technology not only offers a unique smoothness of operation, but also encourages responsible management of water and energy. In cold-water mode and positioned mid-lever, the ES technology springs into life. This eliminiates opening the faucet in mixed cold and hot water mode, saving energy by avoiding the unnecessary heating of water for your daily rituals like brushing your teeth or washing your hands. When you need hot water, the wide operating angle of the lever ensures that by moving it 90 degrees left of the mid position, the flow of water is ultra responsive and precise, giving you total control over water and temerature. GROHE SilkMove® ES is a harmonious marriage of design and technology, delivering an enhanced water experience while encouraging responsible management of resouces. GROHE faucets are designed as beautiful decades on as they did the day you first fell in love with them. The special recipe lies in GROHE's long lasting surface quality. GROHE StarLight® Technology. Continuous improvement over the past 75 years has seen GROHE's unique plating process refined to produce a robust and immaculate that is recognised as one og the best finishes in the world. 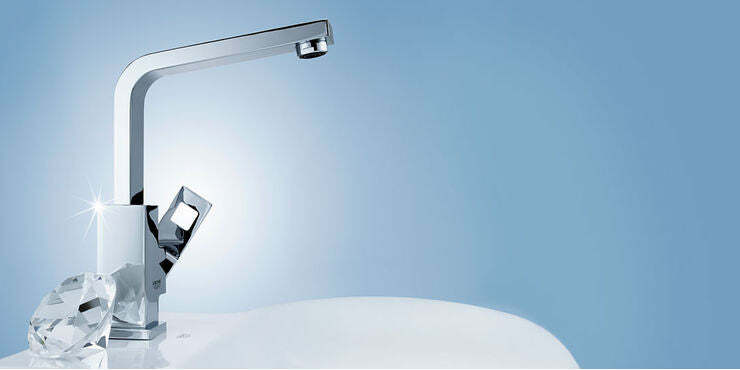 As well as chrome finish, GROHE uses state-of-the-art machinery to deliver exceptional finishes. The Physical Vapour Deposition (PVD) process ensure that the surface compesition is 3x harder, delivering glistening gold or stainless steel finishes. As well as being harder, the surface is also 10x more scratch resistant, so it can be admired for a lifetime. Across the full spectrum of GROHE finishes, from matt to chrome and in all colour choices, GROHE StarLight® delivers a made to last finish. The flawless, long lasting surface is designed to be extrememly resistant to scratches and dirt, making maintenance effortless and ensuring good as new looks for years to come. GROHE DreamSpray® technology is at the heart of every GROHE shower. Boasting the absolute finest quality, it incorporates innovation that helps you to enjoy an unparalleled showering experience. The advanced shower engines inside the shower head deliver precision and constant water distribution to each individual nozzle. Whatever spray pattern you choose, for whatever mood, you will be assure of sheer enjoyment under the shower. Exciting innovations include the new and highly sophisticated GROHE Bokoma Spray®: eight flexible nozzles create a 'breathing' effect, imitating a relaxing fingertip massage. The GROHE Rain O2 technology infuses water drops with air for a fuller, richer shower spray. But there is more. Some of the latest GROHE showers offer the choice between the classic GROHE Rain Spray and GROHE Rain O2. This allows you to choose between a softer or more active jet at any time for every member of your family. The one click shower spray selector gives you direct access to your preferred spray pattern. Never again will you have to twist the spray face or click through several patterns before you reach the one you want. 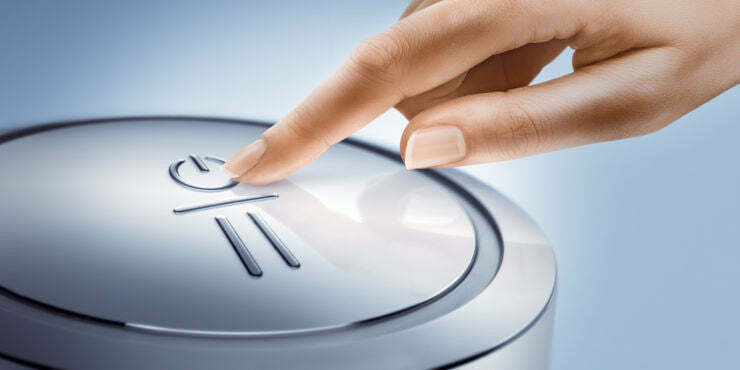 Just press the corresponding button and enjoy! 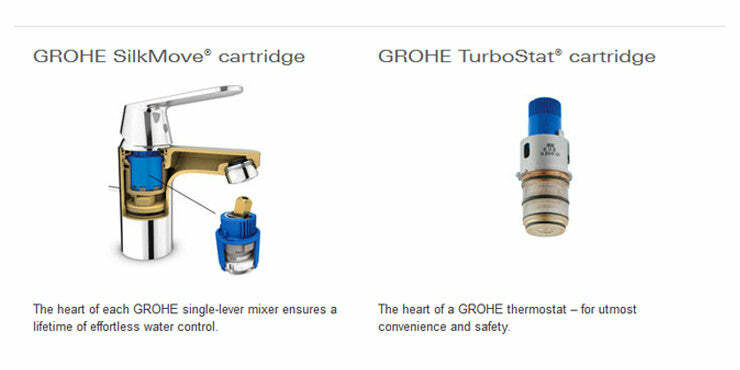 Grohtherm thermostats are equipped with the most advanced and precision-made cartridges in the industry. By increasing the sensitivity of the thermo-element, our thermostats react to changes in water pressure twice as fast as before. So, no more time and water wasted over fiddling with the shower controls to get the temperature right. 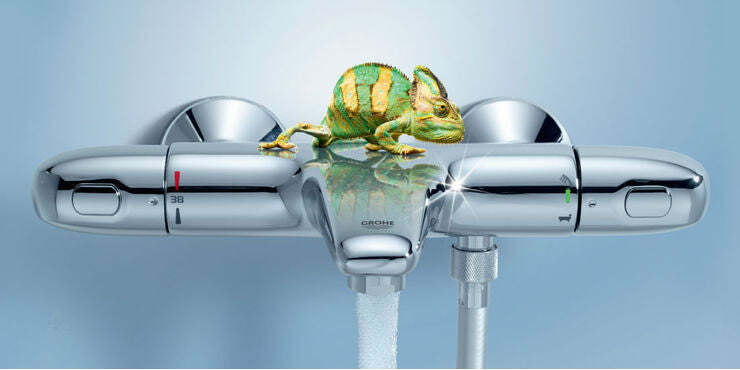 GROHE CoolTouch® technology ensures that there is no risk of scalding on hot chrome surfaces. This piece of innovation is due to the internal 'cooling channel, which creates a barrier between the hot water and the outer surface. With GROHE CoolTouch® technology the entire outer surface of the Grohtherm 3000 never exceeds the temperature of the shower water. For peace, comfort and design freedom, GROHE concealed cisterns feature GROHE Whisper® technology. Thanks to the decoupled pipe supports, there is no sound transfer to the structure of the building when the water is released from the cistern to the bowl. Allowing the WC to be located in the most convenient location without fear of disturbing others. 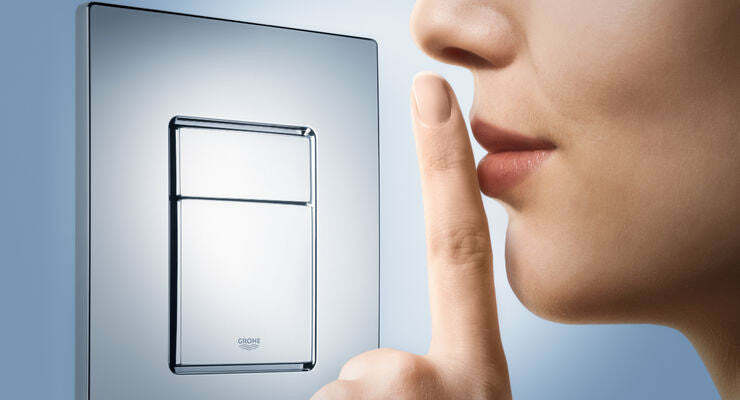 GROHE Whisper® technology, whisper quiet flow noise for added comfort with Rapid SL Installation Systems. GROHE believes technology should make things easier and reduce the complexity of everyday life. With GROHE Digital®, a single touch is all it takes to start your perfect bath or shower. The GROHE Digital® brings simplicty to the bathroom. Intuitive user icon allow you to easily pre-program your preferred combination of water temperature, flow rate and duration. Create you own water experience and start it with a touch of a fingertip. The new GROHE FeatherControl cartridge brings joystick control to a whole new level. Using state of the art coated ceramic disks and an innovative sealing system. 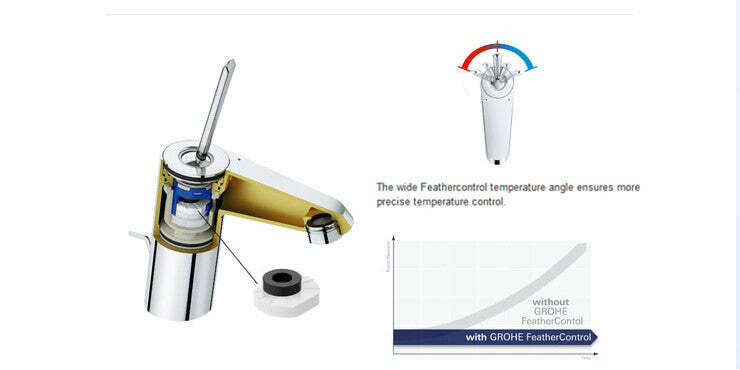 At GROHE the engineers a joystick cartridge with a wider volume and temperature angle, for more precise control and with the same silky smooth operation ag GROHE's renowed GROHE SilkMove® cartridges. Only GROHE mixers deliver the unique GROHE FeatherControl experience. The smooth, rich handling of GROHE's joystick-lever mixers perfectly expresses the quality and superiority of the GROHE brand. The distinctiveness of GROHE products has its foundations rooted deep in the unique internal components that GROHE manufactures. To demonstrate GROHE's exceptional stable of unique technologies, GROHE gave them recognition. BlueCore™ by GROHE sets apart the technology at the heart of GROHE mixers, thermostats and watertechnology systems. BlueCore™ denotes utmost precision and outstanding ease of use. Highlighted in a blue colour, BlueCore™ epitomises GROHE product quality, uniue functionality and the GROHE corporate spirit. It's a magical brand core that highlights all GROHE innovations and technologies that offer Pure Freude an Wasser.